Which has to be the coolest phrase ever. I’m aware that the chances of me becoming a General of the Roman Army (a Legatus) are pretty slim; but who knows, there might a scenario where I could actually pronounce it with making a complete fool of myself. For instance, my 9-year old nephew is a killer farter (he looks so angelic and then lets out a ripper, usually when we’re in the car). So maybe one day I can unleash him in the elevator of my building with my new neighbor — that will teach him a lesson about slamming drawers in the middle of the night. There are actually more chances for me to pronounce this one (compared to the other). Though I want the scene to be overly dramatic, if possible with suspenseful music playing in the background, and dim lightning. Is that too much to ask? The third phrase must remain a secret until the time it is uttered. It is an awesome phrase, reserved for a proportionately awesome moment in my life. If that will ever happen. And when I say it, I totally mean it, trust me. It’s not just a catch phrase I use to fill a blank space on the page. For real people. 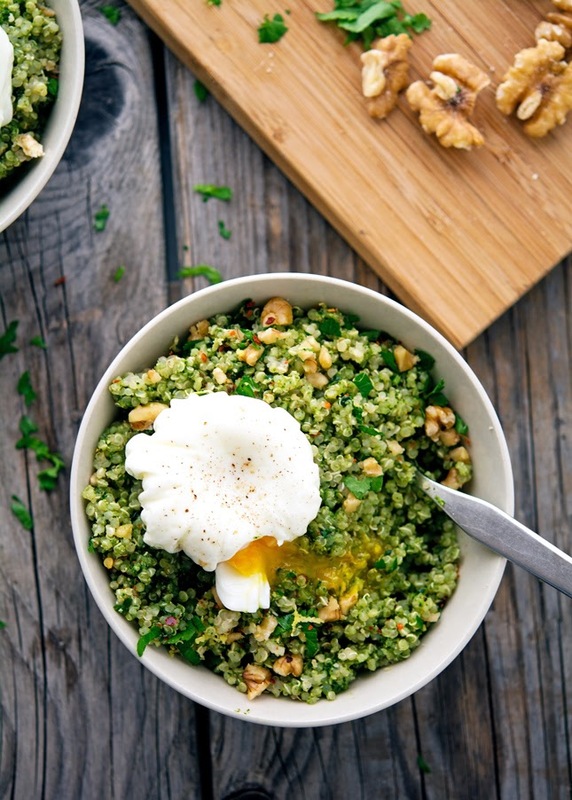 Take these quinoa kale pesto bowls with poached eggs. They are legit, in all respects. My idea of what food should be. They’re also so easy to make. They literally come together in 20 minutes tops. Sure, if you have some leftover kale pesto (like I did) then this recipe is a complete no-brainer. 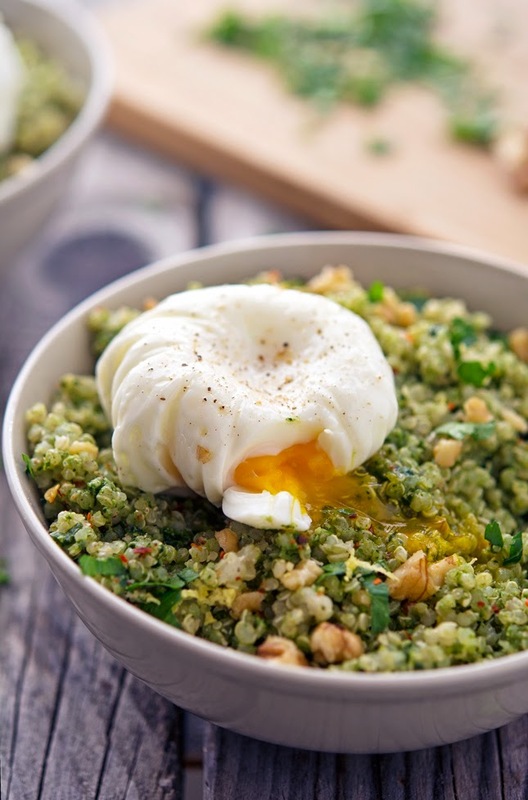 Cook some quinoa, poach an egg and voilà lunch or dinner (maybe even breakfast) is served. But even if you do have to make kale pesto from scratch, it’s still going to be super duper easy and quick. And trust me, you’re going to unleash hell on your table because they’re going to fight over the last bit. That good. 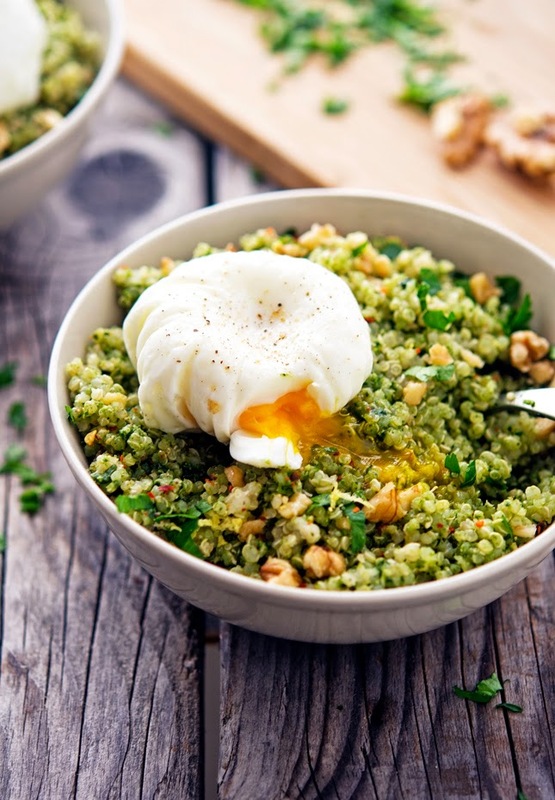 Quinoa Kale Pesto Bowl with Poached Eggs Print this recipe! Heat a splash of olive oil in a saucepan over medium-high heat, and add the drained quinoa. Cook, stirring, for about 1 minute, letting the water evaporate. Combine cooked quinoa with kale pesto, and mix to coat the quinoa thoroughly. Divide quinoa among separate bowls. Top off quinoa with lemon zest, chopped walnuts and red pepper flakes. 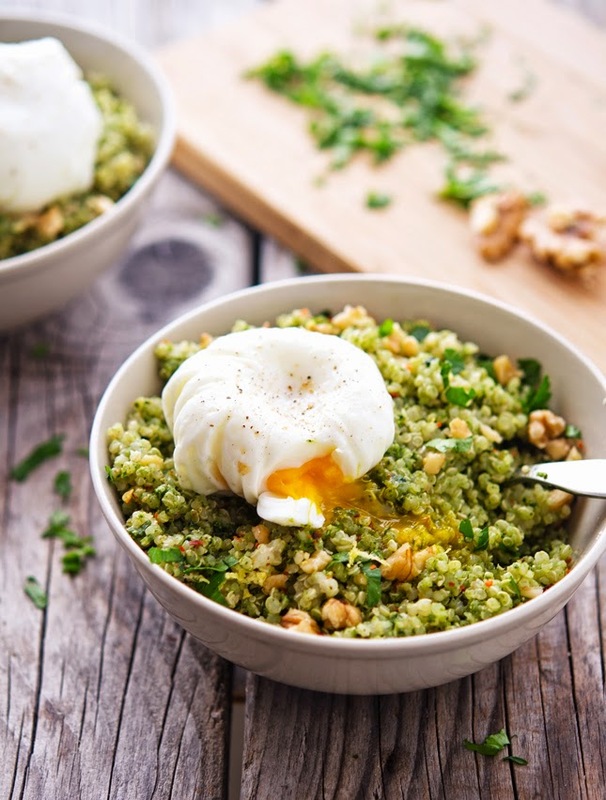 Make poached eggs (I use this foolproof recipe) and serve them over quinoa bowls. Sprinkle some salt and pepper on the eggs and serve! One serving yields 290 calories, 15 grams of fat, 21 grams of carbs, and 11 grams of protein. Great phrases! I can take a guess at the last one ;-) This looks delicious. We need a match between your nephew and our Jack Russell, Buck. so I guess the last phrase you will never tell. TEASER! Interesting phrases ! I'm going to think about my own ones. I checked out your kale pesto and it looks fantastic. Probably all lines from "The Gladiator" are epic, because that's an epic movie. Let me rephrase that it's THE epic movie! Can't say I'm familiar with the first two phrases but oui to the last one. Especially if it HAS to be this recipe! Love the idea for the kale pesto. I'm sure making it next time. Pinned! This is totally one of those recipes I want to eat right away because it looks so good! Why do I not have leftover pesto??! Argh! 'Why not have leftover pesto' that is a question I often ask myself, because there's never enough pesto in my life! These quinoa bowls look great Mike - and definitely make for a perfect nutrition filled meal. I never have made a kale pesto before and you definitely have motivated me to try the recipe now.. looks and sounds delicious! I TRULY HATE that I cannot eat quinoa or cheese. Stupid. I just finished making this and was so proud that I posted pictures everywhere. I accidentally used a cup of pesto but really, it was still so delicious. Absolutely kills that cheesy pasta craving I get once a day lol. Can't wait to try this recipe! I have one phrase that I'd love to say some time - "Call the pilots, we're going home." Sprinkle pepper on the eggs drives every recipe flavor. Awesome look & yummy. This dish is great. I've made it a few times with variations -- some more successful than others. First time, I used couscous instead of quinoa since there was no quinoa around and it was delicious. The second time I tried it without blanching the kale and it didn't work out so well - I think the blanching reduces bitterness. This time I used cauliflower rice from Trader Joe's and it's delicious again. I've tried it as well with couscous and I liked it a lot. I'm gonna try it as well with cauliflower rice, sounds amazing!